How Inside Out resonated with our journey to open adopt. You start out joyous and hopeful then the longer you wait it slowly transforms into anger (scams), sadness (why not us/failed matches), disgust (scams) and even fear (will we ever get picked? Will it fail at the hospital?). You do everything you know to tread the emotions with dignity and humility but scam after scam dwindles your ability for compassion and you struggle to retain your humanity and personality without bitterness and paranoia. It’s a daily struggle to remain positive and busy. When everything seems bleak, sad, and hopeless we get a glimmer of hope only to have those hopes dashed. How do you continue? 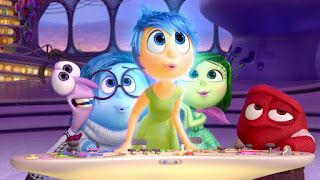 Like Inside Out it’s about feeling all that, sometimes at the same time, and still working through all those emotions to make decisions for ourselves that affect our futures. Joy can't exist without sadness, doubt, fear or anger because if we didn't have the negative feelings we wouldn't understand the joy, happy, elated or content feelings we feel day to day. We wouldn't strive to better ourselves or our situations without the pain of those emotions. They make up the lessons learned in life and more important who we are as individuals. I'm a rather blunt person, not in a negative way just matter of fact. If someone asks why we’re adopting I’ll be frank about it same as if they asked the time of day or what kind of dog I have. I am also a sensitive person who wants the best for everyone I meet but I'm also not delusional in that not everyone is out to better themselves but rather to feed emotionally on those waiting or to try to gain financially from adopting couples. That’s not how Adoption is supposed to work and over time it makes us leery with all contacts especially via email, private message or text. I jump every time the phone rings or dings that I’ve gotten an email or text even though 99% of the time it’s people looking to scam adoptive couples. Thank goodness for Report as Spam buttons. We want to be excited and hopeful that this is the one meant for us. I strive to make my compassion shine through in written forms of communication but it just depends on how it’s interpreted by the reader. Adoption at the end of the day is just like Sadness and Joy going through the maze and trying to get back to head quarters. It was that journey where they really learned what each had to offer and how important they both were to the well being of Riley. That’s how open adoption should work and we hope will work for us.